I suppose I’ll start out by saying that I really like my iPhone 4. It does nearly everything. It’s a phone. It’s data organizer. It’s a web browser. It’s a media center (music & movie). And it’s a gaming machine. I’ve picked up a few titles here and there and really like them. Things like Angry Birds, Field Runners, Scrabble, Ragdoll Blasters and such. Most accommodate the touch screen interface nicely but the action is pretty light. A few months ago I noticed Street Fighter IV in the App Store. I imagined trying to play on the touch screen and cringed. It wasn’t until the game went on sale a week or so ago that I finally bought it (I was a Street Fighter junkie when I was a kid). I turned on the game expecting to be mildly entertained for a few minute. I was wrong. Street Fighter IV has turned my iPhone 4 into a mini arcade. For lack of a better word the controls “feel” great. I’ve played other games where the “joystick” just didn’t feel right and the touch response was unmanageable. But Capcom got this one right. It’s not perfect, but control is very good and the game is a blast to play. I’m sure by this point I’ve logged a few hours. I can recommend this title to anyone (it also works very well on the older iPhones). Around the same time I noticed a new app by Hudson. A TurboGrafx-16 emulator. I was floored. I got it right away and literally downloaded a fortune of nostalgia (you buy each game separately but they are contained within the app). I played Bonk’s Adevnture and Bomberman ’94 for awhile and found the emulator to be very enjoyable. The controls don’t “feel” quite as good as they do in Street Fighter IV (I especially found shooters to be hard to control) but again, the touch screen buttons are really pretty good. I love having one device (iPhone) where I can just switch between games like these. …you could buy portable video game systems that took cartridges! I don’t know how many existed (you can actually read a neat little portable video game history here) but I had a Nintendo Gameboy, an Atari Lynx, a Sega Game Gear and (my favorite) an NEC Turbo Express (a hand held version of the TurboGrafx-16). While I enjoyed playing the games I was almost as interested in the technology that powered them. I spent hours pouring over specifications, hand counting pixels and designing my own “perfect” machine (I used to make my own little magazines with game reviews and system comparisons). I fantasized about a device that would play all the games. 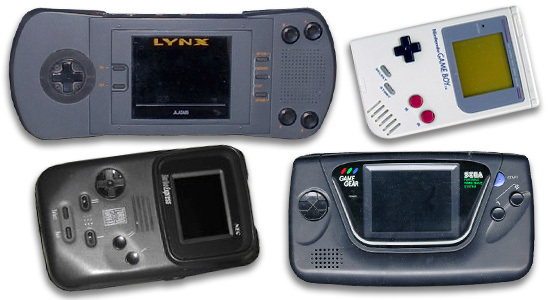 Just for kicks here are the resolution specifications of the early portable gaming systems: Gameboy resolution (monochrome): 160×144 pixels, 2.6″ diagonal | Lynx Resolution (color): 160 x 102, 3.5″ diagonal | Game Gear Resolution (color): 160 x 144, 3.2″ diagonal | Turbo Express Resolution (color): 400 x 270, 2.6″ diagonal. I remember being obsessed by the Turbo Express unit’s pixel density (go ahead, have a crack at it). Compare this to the iPhones now: iPhone4 (960 x 640, 3.5 ” diagonal) | iPhone3 (480 x 272, 4.3″ diagonal). Many of these systems endured through the early and mid 90’s. Meanwhile PC gaming was becoming bigger, PCs were getting smaller (PDAs). Phones were getting more powerful too. In the late 90’s and early 2000 a slew of cool new devices were released. The Compaq Ipaq (resolution 320 x 240, 3.8″), HP Jornada (same resolution, smaller screen) and Motorola Razor (resolution 220 x 176, 2.2″) stand out in my memory. At that point no one had successfully combined a phone and a PDA into a single device. I remember having an iPaq and all I did was use it to take notes and play games. The touch screens back them were nothing like what we have now. In fact most PDAs supported only a single touch at one time. No virtual joysticks or buttons (well, none that worked). Portable PDA gaming had a long way to go. As did Phone gaming. My Razor had Chessmaster and a Fast and Furious game (really bad, by the way). I could make calls, play simple games and kind of organize things. But a gaming “experience” on a phone or PDA was going to have to wait. There was also Sony’s 2005 PSP entry. I picked one of these up with high hopes. It was a great system with some super games (Megaman X and the Street Fighter series). The PSP allowed you to play games, watch movies, listed to music and surf the web. The 4.3″ screen (resolution: 480 x 272) was the defining characteristic of the front. However the unit was too large to be practically carried everywhere and was not a phone. Around the same time companies began releasing PDA phone combos. There were some exiting models with a bit of gaming promise. I was an avid fan of Sprint’s HTC line (check out my post about some of the Spring phones I’ve owned). But they just didn’t have the power to pull off any “real” games. All I really wanted to say was that I’m impressed by the evolution of portable gaming. I enjoy downloading applications (as opposed to having cartridges). I love the power that comes in a package as small as the iPhone. I’m floored by the screen resolutions that we have now (PS- I hope there is a Street Fighter IV update that takes advantage of the iPhone 4’s incredible retina display). I’m amazed at how much one device can do and how seamlessly it can be accomplished. The future’s going to be cool. I’m going in. Posted January 3rd, 2011 by Cam Hughes.